BHP says it does not believe it has enough iron ore stockpiled at Port Hedland in WA to meet its contracts with customers after the deliberate derailment of an out-of-control train disrupted its rail operations. The miner suspended all of its rail operations on Monday after it derailed the iron ore train, damaging 1.5 kilometres of track and crushing many of the 268 fully-laden wagons in the process. BHP said yesterday it planned to use its stockpile reserves at the port in order to maintain supply over the coming days. However, the company now says it expects the reserves will not be sufficient to cover the period of disruption until partial rail operations can resume in "about one week". "We will be liaising with our customers in relation to our contractual commitments over this period," a BHP spokeswoman said. The train derailment happened about 5:30am on Monday and was coordinated from BHP's remote operations centre in Perth, about 1,500km away. 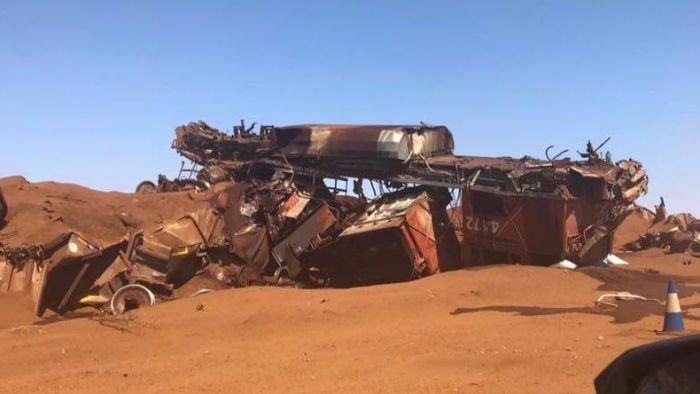 The driver had stopped at Hesta Siding to check a wagon, but the train — en route from Newman to Port Hedland — took off without him and careered 92 kilometres down the track before being derailed at Turner Siding. Vision of the wreckage showed the force of the impact caused many wagons to be crushed or tipped over, with others shunted off the track.